Having a baby often comes with some time off from work, but the amount of time off and whether you will be paid vary from employer to employer. This can be an added stressor for many women; however, maternity leave is often is up for negotiation. Consider negotiating maternity leave with your boss by following these steps. Maternity leave is defined as the time a new mom takes off from work after having a baby. Most women take the time immediately following a birth to recover and tend to a new baby's needs. Some companies will offer paid maternity leave for a period of six weeks or more, but others offer nothing. Under the Family Medical Leave Act (FMLA), certain parents of either gender can take up to 12 weeks of unpaid leave from work to care for a new child. To qualify, the new parent must have been with their company for at least a year and worked at least 1,250 hours during the past year. They must also work for a company with 50 or more employees. The Family and Medical Insurance Leave Act (FAMLI) was introduced in Congress in February 2017. If the bill passes, it will provide paid family and medical leave, equal to roughly two-thirds of a person's monthly pay, for up to 12 weeks a year. Depending on the formality of your office, carefully choose the medium by which you announce your pregnancy. 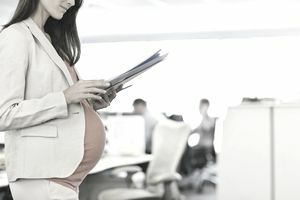 You may have to provide a maternity leave letter, but it's best to have a face-to-face meeting in the office prior to handing in your letter, which may also need to be submitted to the company's human resources department. You want to talk with your boss about your maternity leave options before the office rumor mill begins working. For this reason, it's wise to request a face-to-face meeting with your boss before announcing to your co-workers that you're pregnant. Discussing maternity leave should happen sooner rather than later in most offices. This extended time frame allows your employer to devise a plan for when you're on maternity leave. Before meeting with your boss and negotiating maternity leave, figure out the number of weeks you'd like to take off from work after your baby's birth. Check with your company's human resources department or the employee handbook to see if your company has a policy regarding maternity leave. If there is a company policy on maternity leave, decide if it's right for you. For example, perhaps the company offers six weeks of paid leave, but you want more time before returning to work after you've had your baby. You may want to take the employer-provided time as well as an additional leave of absence under the FMLA. Once in the meeting, clearly state your desired maternity leave. Then sit back and listen. Consider this conversation a starting point for discussion, and keep an open mind when it comes to your employer's concerns or needs. If you desire more maternity leave than what is outlined by your human resources department or in your company handbook, explain your reasons. For example, if your company doesn't offer paid leave and you can afford to take 10 weeks unpaid, tell your superiors exactly why you need this time off from work. It could be because your partner can't take time off from work, you don't have a nanny lined up yet, or you simply desire to be home during this time in your baby's life. If there isn't a firm company policy on maternity leave, ask for what you want. If your boss is agreeable, the process is over. You need time to transition into your new role as a mother. You want to have a good start at breastfeeding your baby (and that your goal is to pump when you return to work). You want to start a quality relationship with your baby to decrease the chance of postpartum depression and to care for the mental and physical health of yourself and your baby. A long maternity leave reduces infant mortality rates. If your company doesn't offer paid maternity leave and you can't afford to take unpaid leave, try to work out a flexible schedule where you might be able to work from home several days a week for the first six weeks after your baby's birth, or possibly ask to work part-time for a while.